Composite materials bring together precision and innovation in uniquely elegant designs. Are you seeking luxury design in materials other than gold, steel or titanium? Our composite and carbon-fibre materials bring together the aesthetic qualities of luxury design with ultimate technical performance, in order to meet the highest demands of contemporary watchmaking. Our materials unite high resistance, light weight, biocompatibility and warmth to touch with diversity and sensuality. 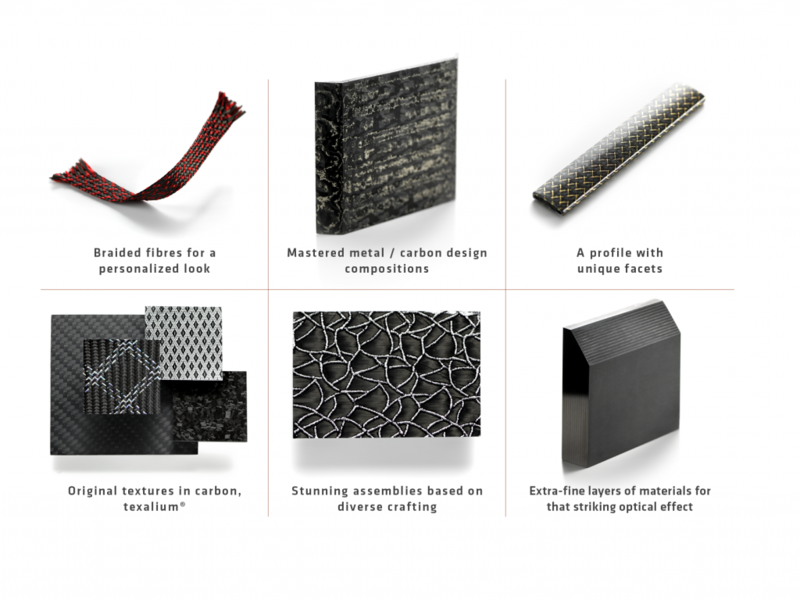 Composite materials bring together precision and innovation in unique designs. Light weight, about five times lighter than comparable steels. Approved sealing. 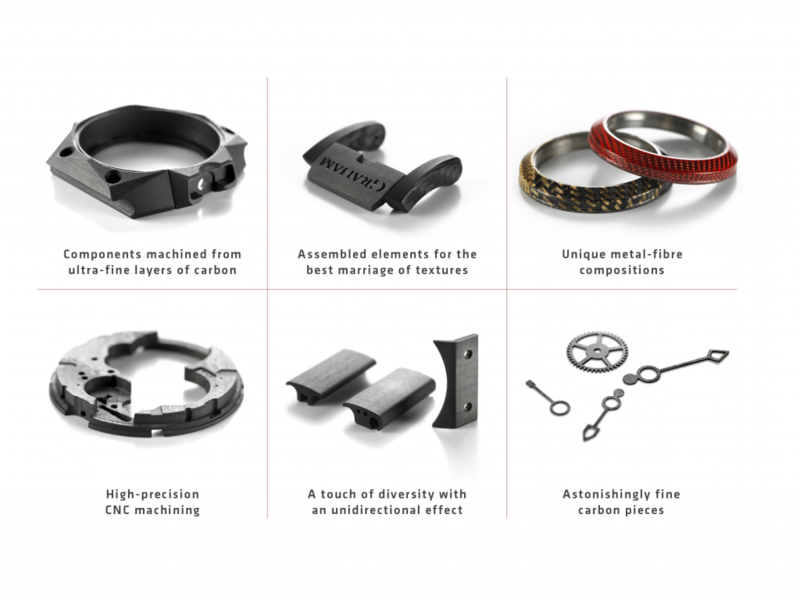 Even as early as 20 years ago, Composites Busch was revolutionising luxury watchmaking by offering the very first dials in carbon fibre.Today, not only dials and case middles, bezels, crowns and bracelet fasteners are manufactured from carbon fibre materials in the most diverse and daring of forms, but also watch movement components. All with one essential objective in mind: absolute precision. Our tailor-made composites offer new sources of inspiration and prestige. The manufacturing technologies integrated into our materials have been developed to best serve your watch-making designs, whether machined or moulded carbon. Parts are ready to mount and distinguished by the genuine artisanship of a jeweller due to perfect CNC machining, laser-etched surface finishing, or pad printing. Machined carbon from rough blocks we compress and link through custom recipes for each design. Moulded carbon shaped to your forms for maximum optical effect, following the contours of each part. Parts ready to mount and distinguished by the genuine artisanship of a jeweller, due to perfect CNC machining, laser-etched surface finishing, or pad printing. Our integrated R&D division at Composites Busch adds enormous value to your ideas throughout the entire value chain – from the creation of high-tech composites through to machining. Our deep understanding of the demands of the watch-making industry, combined with our mastery of composite materials, enables our specialists to unleash the full creative potential of carbon, helping to turn your creative ideas into reality. Composites Busch is the expert partner at your side who can guide you throughout the creation of exclusive, unique and original products. Our integrated Research & Development division at Composites Busch adds astounding value to your ideas throughout the entire value-adding process – from the creation of high-tech composites through to machining. Our deep understanding of the demands of the watch-making industry, combined with our Mastery of composite materials, enables our specialists to unleash the full creative potential of carbon, helping to turn your creative ideas into reality. In order to maximize innovation capabilities, we work in teams that are dedicated to precisely achieving each of your requirements. Discipline, Quality, Responsiveness and Experience all make Composites Busch the ideal partner for your high-end watch-making creations in carbon – the new hallmark of contemporary luxury.